Want to work in the Outback? How about running a cattle station or trying life on a hippy commune? Here’s how…. Someone just asked me about my experience of trying to find farm work while travelling in Australia. I guess it depends on how much time you have and how much money you need, but one thing is for sure, it doesn’t need to be boring. Luckily I wasn’t desperate for cash and was therefore able to use voluntary work towards my 88 days. 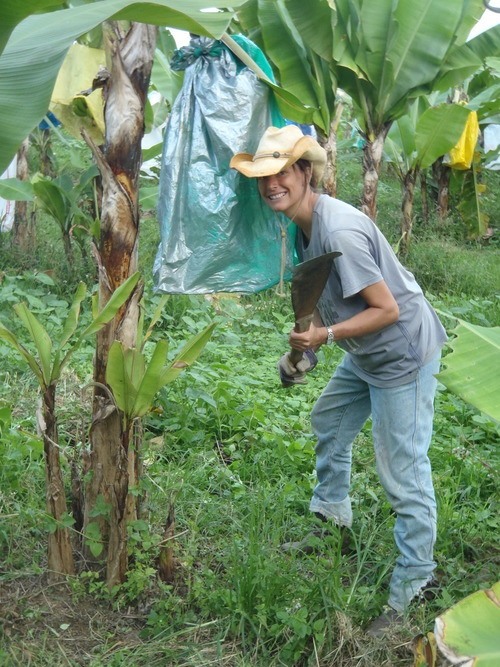 WWOOFing (willing workers on organic farms) was a great way to do this. There is even a book which lists farms involved in the scheme. It was a fantastic way to try new experiences while only having to work very short hours. I spread the work over the course of my trip, working on a banana farm (along side the mentally insane – see my previous post), a cattle station (very, very Aussie and the opening scene to the book), a hippy commune (as I’m sure you can imagine there were some perks to that one) and vegetable farm (a little dull after working with animals, hippies and mad people). By doing 2 – 3 weeks at each place it allowed me to try new ways of life without getting bored of the work, however to spread it out like this you need to have plenty of time left on your visa. It can also be hard to find placements. As you will read in ‘Kangaroos and Chaos’ I originally found a work hostel which charged over priced rent, with the promise of finding me work. However, after talking with other travellers I found that there was never any guarantee of getting a job. In fact, they had been sent to stand on the street at 6am every morning while farmers came to chose them! I can’t say this is true for all work hostels (I’ve heard a few positive stories too, so ask around and try to get a recommendation. The backpackers forum is good for this – Link at the bottom of the page), but it certainly put me off. Apparently it made them feel like hookers without a decent wage! On the plus side, I stayed in a rural hostel in Victoria and got local contacts such as the hostel owners and other working backpackers, to ask around for me. After gathering some phone numbers I offered to work free trails to learn the ropes on dairy farms. Through this I eventually found a job. Having a car was a big help and already being in the area apposed to calling from the city most likely helped too. If you had told me at the start of my trip that I would spend 3 months on farms, I would have laughed it off, but not only did I do it, but it turned in an insanely random adventure.